Our first impressions of the Egg Quail were extremely positive! The Egg Quail is a neat folding; super stylish; beautifully finished pushchair which really is every parent’s dream. We love the glossy finish to the chassis; the clever fold; the perfectly formed harness buckle and even the detailing of the Quail footprint on the wheels. The luxurious fabrics are stunning – our Latte fabrics have a beautiful subtle sparkle which isn’t too bling but just makes the pushchair shimmer and twinkle slightly in the light. Everything about this pushchair at first sight was tempting us to touch, feel and to try it out. It is a very tactile pushchair. The Quail is the sister pushchair to the Egg pushchair, and the similarities are very similar. However the Quail is much smaller and lighter. One of the main differences is that the seat isn’t framed, and the seat folds in half when folding the pushchair. However the Quail makes no compromise for being at first glance smaller and lighter, and it retains the sturdiness, solidity and beautiful push of the Egg. We love the cute little bird ‘Quail’ logo so much – a neat touch which makes us smile each time we see it. The Egg Quail has a seat which is reversible. Therefore the child can either forward or rear face. The seat detaches and can be turned around in order to do this. There are three recline positions including a very upright seated position and a lie flat position. These are are accessed via an integrated lever at the rear of the seat, which smoothly reclines the seat with a little click at the end. The seat is suitable for a baby from birth although there is a very comfy carrycot available for a newborn baby. The carrycot package includes the adaptors which can also be used to fit a car seat, which is worth considering when weighing up whether to purchase a carrycot and/or use the pushchair as a travel system. The adaptors can fit a Cybex, Kiddy or Maxi-Cosi infant carrier to the chassis, when the seat is removed. The seat itself appears to have two layers. At first we thought there was a liner, but the extra padding on the top half of the seat is a neat way to cover up the unique adjustable harness system. The upper ‘liner’ part is very well padded and there is no doubt that any child will be comfortable. The harness and crotch pads are also very thick and should be very comfortable for even a small baby. Our baby tester looked great in the seat; and so equally did our huge 7 year old tester (who decided he wanted to try it out and amazingly fitted), so we have no worries about the longevity of this pushchair because it will certainly last your children until a pushchair is no longer needed! Without doubt this is a pushchair that offers a comfortable seat for a child whatever their age. The Quail has a very unique harness system which is super easy to adjust from the rear of the pushchair. So no matter what age child we put in the seat, within seconds we could adjust the harness to suit them, and therefore ensure each child was always kept safe. The harness system is hidden behind a magnetic back panel, which does really require some fingernails or a blunt object to remove it. The harness system comprises of two squeezy buttons – which you can do with one hand – squeeze each side in and then lift or lower the bar into a new position. There are 6 different harness height positions which in itself is unique to the Quail pushchair because most pushchairs only have 2 or 3 positions. Having this ability to personalise the pushchair to a child, means that they will be always be super safe, without having the usual fiddly struggle to alter the harness settings. This is a particularly useful feature for parents with siblings and would make the Quail a sensible choice for childminders for whom one pushchair often needs to work for different aged children. Behind each harness pad is a slider buckle to make the harness longer or tighter. The harness lock itself is gorgeous. It is egg shaped and white, with the ‘egg’ logo in the centre. The harness is a 5 point one but with only two parts to insert into the buckle, which makes it so easy to do up. The large harness pads prevent the harness from twisting which makes it simple to get the harness correctly fitted. The two parts of the buckle fit together, one on top of each other, and then need inserting together firmly into the egg shaped socket. It does require a firm push, but equally it needs a good press to open, which makes it more child proof. When your 7 year old can’t undo the buckle you know it is good! Also behind the back panel is another adjustment system – this is one which moves the hood height up or down, so that the hood can be lower on a baby, or high up for an older child. This again is unique to the Quail and is absolutely awesome. It means a little one can be kept snug away from chill winds and so too can their older sibling without them looking big in what is a huge seat! The pictures that we posted of 7 year old Master BB in the Quail seat became one of our most popular and most shared images ever. If you know your child is likely to be in a pushchair longer than most, then the Quail should be top of your shopping list. The upper weight limit is a huge 22kg, which is the size of an average 6 or 7 year old child. There are other pushchairs on the market with large weight limits but they don’t have the seat capacity to match. We can only think of one other pushchair (non SEN) that has the seat size and weight capacity to match the Quail, and that pushchair only forward faces, when the Quail has a reversible seat. The hood itself is beautifully lined and has two panels with a large padded flick out visor. It is unusual to have a pushchair with just two hood panels however the coverage is excellent and will protect a baby’s toes from the sun in summer. The hood is a little noisy to open, but we love the satisfying ‘puff’ as you full the hood fully open! A real sign of quality! There is sufficient leg room for a baby’s legs on the calf rest part of the seat, however this is not adjustable, so an older sleeping child will have to dangle their legs, and we would suggest that a little one would look more comfy in a footmuff in winter so that they are not quite as exposed. The seat depth becomes an advantage for a much older child, who will have good depth to support their thighs, whilst their feet can rest easily on the lower footrest when the seat is forward facing. Turning the seat around is a little tricky because of the way the seat operates. When you first open the pushchair from folded, the seat is folded like a clamshell and needs lifting upwards. However, it is important as you do so, to open the clamshell up so that the calf rest (lower) part of the seat is a right angle with the back of the seat. If you don’t achieve an angle, then the rear of the seat simply keeps falling backwards and the seat ends up pointing to the floor but on the other side! It’s difficult to explain, but you need to open the upper and lower parts of the seat at the same time into a seat shape, you can’t lock the back into an upright position and then manipulate the calf rest part as you can with similar clamshell fold seats. The seat lifts off using sliders on each side of the seat. Push these simultaneously backwards and then give the seat a big tug off the chassis. The seat should come clear of the chassis. It is possible to lift the seat off the chassis when open and turn it around, but you will find that the seat will not lock into position until you fold it into a clamshell again. We find it a little tricky to find exactly where the seat fits back on, but thanks to the amazing fold, the seat can be left on in either forward or rear facing positions which means that swapping the direction of the seat is not something you would do often. Therefore this is not really a negative like it would be if the fold was a 2 piece fold. If you really need to split the chassis to fit it in the boot of your car, then you may need to consider whether you would find this tricky on a daily basis, but the fold is so neat and flat that we aren’t sure there would be any advantage in splitting the pushchair into two pieces. The magnetic backpanel can be chosen to suit your tastes or colour of the pushchair at point of purchase. There are currently 8 designs / colours but these will change with the seasonal fabrics. Most of the designs are snake or animal skin which is not to our personal taste, but we did pick out a more neutral textured brown cover for our Quail, and there is also a plain black cover. It is very neat how the panel just pops on and off although as mentioned above it needs prising a little. We particularly love popping the back panel back on. There is no bumper bar, nor is one available. Due to the ‘unframed’ nature of the seat there would be nowhere to clip it onto. The Quail has a excellent size basket. Our cat couldn’t wait to snuggle up in it, but quickly got moved in favour of throwing in a pile of toys and teddies by Master BB! On a more practical basis there is plenty of room for a typical large changing bag or a few carrier bags of shopping. There is good access to the basket from the rear. The back panel is elasticated to allow some movement as you push a changing bag in. The best access to the basket is via the front of the pushchair, which is excellent when the seat is rear facing, but still very good when the seat is forward facing. If there is no child in the seat, then it is easy to flip the calf rest up and put in / remove items. We like that the basket has good depth and secure sides and rear so that small items don’t fall out as you walk. We love the optional thermal shopping basket to carry frozen food home in, or even as a picnic basket. What a neat idea, however at £80 it is a pricey accessory. The Quail comes with a raincover in the box. A raincover pocket would have been appreciated. Maybe one for future design changes? The handlebar at first glance looks really luxurious with its leatherette covered handlebar with hand stitching. It does finish the pushchair off really well. However, the handlebar isn’t the most comfy one we have ever pushed because you can feel the bar sticking up into your hand when really it needed angling slightly forwards to be able to grip it properly and comfortably. We personally prefer not to have handlebars handstitched as they rub on our hands, but that’s a personal comment, but worth a mention. The handlebar has two neat slots to slot in the straps of a changing bag or handbag. This is really useful to stop a bag sliding down as you walk, and it leaves the basket free for shopping, coats or toys. The clips are also handy to hang coats on too when doing the school run! In the centre of the handlebar is a rotating barrel. Rotate the barrel forwards and this moves the handlebar height up and down through 5 positions. The Quail handlebar has a huge range and would easily suit a parent of short or tall stature. We don’t particularly like the barrel because we tend to push a pushchair with one hand and so we fiddle with moving the barrel forward and backwards slightly as we walk along. Each side of the barrel has protectors to stop the handlebar hitting the floor. Ours quickly got marked which is what they are intended for, but then spoils the look of the handlebar, but our seat removal buttons also quickly got scuffed with having the pushchair folded. The handling of the Quail is beautiful whether we had a small child on board, or a larger one. The wheels are solid ‘Tru-Ride Technology® PU Polymer’ tyres and the front wheels have superb manoeuverability in even the tightest of spots. The ride is really smooth and the Quail was a pleasure to take out and use. The bird footprints embedded in the tyres are just another carefully added touch which brings a smile to your face on even the coldest of days. The brake is situated at the rear of the pushchair. Simply step onto the brake to engage it, and then step on again to release. This is a brake that can easily be applied bare foot or with open toed shoes. The Egg Quail folds very compactly with the seat still attached and facing in either direction. The fold is so similar and so compact, that it is difficult to tell whether the pushchair was folded with the seat left on forward facing or reverse facing. We have tried to demonstrate both a parent facing and a reverse facing fold through a sequence in our photos (see bottom). Folding involves three steps. They are fairly quick and practice makes perfect. Step 1 involves folding the seat down. Fold it into a clamshell, but fold the seat dowards towards the rear of the pushchair so that the hood is pointing towards your feet. This is the same start to the fold whichever way around the seat is left facing on the chassis – so seats left on when either forwards or reverse facing, both need the seat to fold rearwards. Then to do Step 2, ensure the handlebar is in the lowest position, and then rotate the barrel in the middle of the handlebar towards you. You need to go further than you think and you will feel a point where the mechanism releases, and the handlebar will then start to drop towards the floor. Follow the handlebar down until it stops near the ground. The handlebar will lock into position with a locking catch when it is sufficiently low enough. The handlebar won’t touch the ground so its ok to let it drop. Finally Step 3 involves moving to the centre of the basket. In the centre is a hole in which is a button. Press in the button and the wheels of the pushchair start to slide together. This part needs a little practice but if you lean the Quail back against your calves / knees, it is possible to bring the pushchair together to close so that the pushchair is then stood independently upright ready for you to walk away. If you can manage this, then the chassis won’t get scratched trying to fold onto the floor. There is a secondary locking mechanism which is unusual to find on a pushchair, but it does mean there are no ‘flappy’ chassis parts as you carry the Quail around. Having a 3 stage fold and 2 locks doesn’t make for the simplest of openings. However, it does make it quite controlled which if like me you have a back problem, is easier to do each step instead of trying to fling open a whole pushchair in one go. We do find the front lock on the footrest a little difficult to disengage, but its a knack and if you push slightly inwards then there’s room to release the clip easily. Do this lock first to release the wheels and give a stable base. Then unlock the handlebar and lift up into an upright position. Finally unfold the clamshell seat BUT as mentioned above ensure you open the seat base and back together to form a right angle (or more) or else the seat simply falls over the top of the pushchair! We do keep forgetting to do this, but its because we try out so many pushchairs which allow you to put the seat on and then unfold. If the Quail this was your only pushchair, you would instinctively open the seat right every time. The HUGE advantage of the Quail, and probably one of the biggest plus points for us, is how neat the Quail folds. We love how it folds with the seat left in situ on the chassis, with the seat either forwards or rear facing. We absolutely love how beautifully the Quail freestands easily when folded, and how the chassis doesn’t need to touch the ground if you fold into a standing position. The Quail is so neat to store in your home, and takes up relatively little room in your car. And yet the seat is huge, the basket is large and the hood is excellent. It’s all the plus points you need in one pushchair without lots of parts or space required to store. The Quail could be carried once folded using the handle used in Step 3 above, but Egg have left a lip on the plastic at the rear of the base of the seat unit which has just enough room for you to get your fingers underneath and carry the pushchair. We have had many pushchairs here at BBHQ over the last 10 years, but the Egg Quail stands out as one of the best, and most pleasurable to use. It is hard to define what makes the perfect pushchair, but the Quail ticks all our boxes for a neat fold, small footprint stroller, which has a reversible seat, and carrycot and travel system options. The look and feel is that the Quail is a luxury desirable item – everyone who has seen it has commented on how beautiful or stylish it is, or how lovely the fabrics are. The Quail is neat enough to be discreet, but stylish enough to stand out from the crowd, and really is the perfect baby accessory. It is easy to live with and to take anywhere. The wheels can stand up to most terrain, and the manoeverability is excellent. Yes, there are things that maybe could be easier, such as the seat fitting system, and the handlebar could be more comfortable, but in the bigger picture, the Quail sits head and shoulders above the majority of the pushchairs on the market, so can forgive it for our tiny nitpicky niggles when you consider the advantages of the harness and hood systems; the beautiful fabrics; large basket and exceedingly neat fold in either direction. 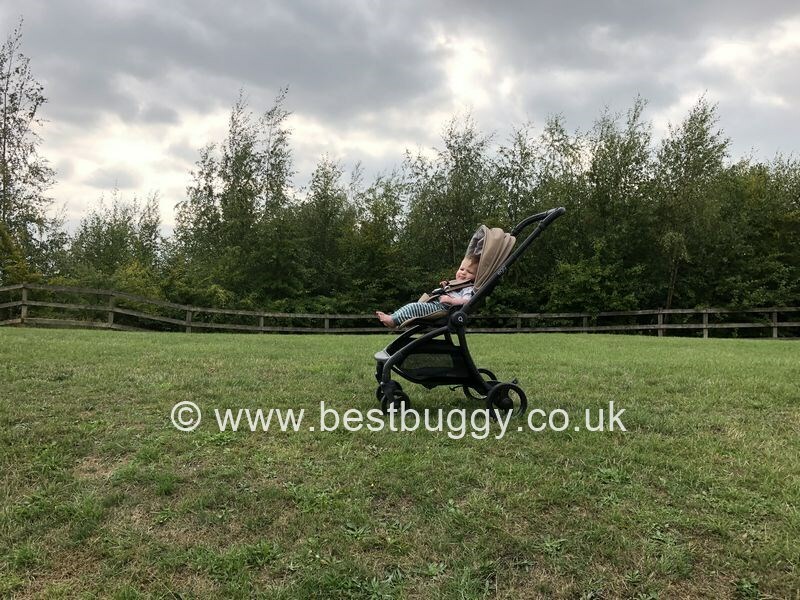 If we were starting again, the Egg Quail would probably be our first choice of pushchair which hopefully says a lot about how good we think the Quail is, and for that reason we are giving it a Best Buggy 5 Gold Star rating. We absolutely LOVE the Egg Quail.